Discussion in 'Reviews and Tests' started by jasonX, May 7, 2017. Now as we go about our day to day activities (which are mostly related to our line of work whether it be IT, business, politics, sales, manufacturing etc.) sometimes a need surfaces for us for our family or for ourselves, say, more vacation time with the family/kids, gigs with the girlfriend perhaps, night-out-drink with the boys, the list goes on. In those events we always take videos/pictures to help us remember that particular event. And then the next thing is either YouTube, Facebook or just a plain DVD or video file for the home viewers. The ones that are funnier we like the best. What if you can make it a notch funnier by making an animation of those image/part (of an image) or insert animation (in the case of videos)? Yeah that would be great but the thing is (often) we do not know where to start. To those who are learned in Adobe very good for you! You can do any animations with Adobe Suites! You guys are a cut above the rest! Way above as I have been on a steep learning curve with it when I started and that was years ago. Heck I still don’t know most of the nifty tricks with Photoshop, Image Ready, Premier and After Effects. I guess if my fingernails were indeed "nails" my head would have scars as if a big darn cat scratched it deeply many times! I can manage now but the "self-learner" that I am says the learning curve is steep for me. Many thanks to YouTube learning is now within grasp and for free. Animation need not be that difficult nowadays and there are plenty of paid and free versions to checkout (all we need is "time" and "leeway" to do it). One such software is Crazy Talk Animator. Crazy Talk Animator comes from a long line of 2D/3D animation software developed by Reallusion, Inc., pushing the boundaries of animation to a whole new era of ease-of-use and flexibility similar to the ones we see in After Effects and Flash animations. While not original in making animations via skeleton or bones-rig-manipulations, Crazy Talk Animator makes it simple to animate via its smart animation and puppet mode and that's just a start! 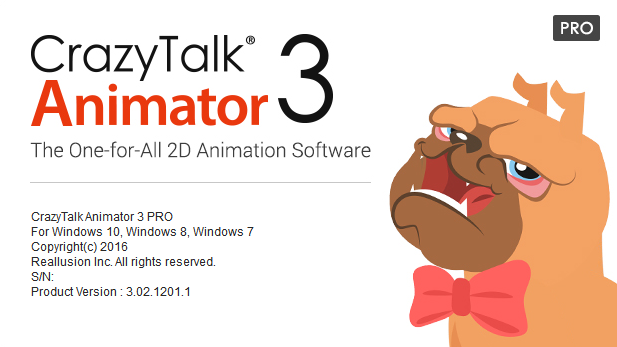 CrazyTalk Animator comes in 3 variants which are: (1) Standard, (2) Pro and, (3) Pipeline. This is a short review of Crazy Talk Animator Pro to show what this nifty piece of animation software is capable of doing (just a small part of its capability) what it can do for the imagination in all of you. So let’s get in on! 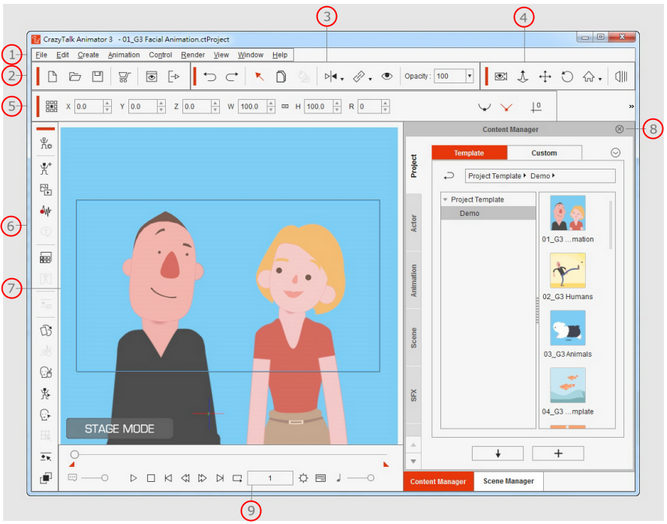 CrazyTalk Animator (CTA) is the world's easiest (aims to be) 2D animation software that enables all levels of users to create professional animations with the least amount of effort. With CrazyTalk Animator 3 (CTA3), anyone can instantly bring an image, logo, or prop to life by applying bouncy Elastic Motion effects. 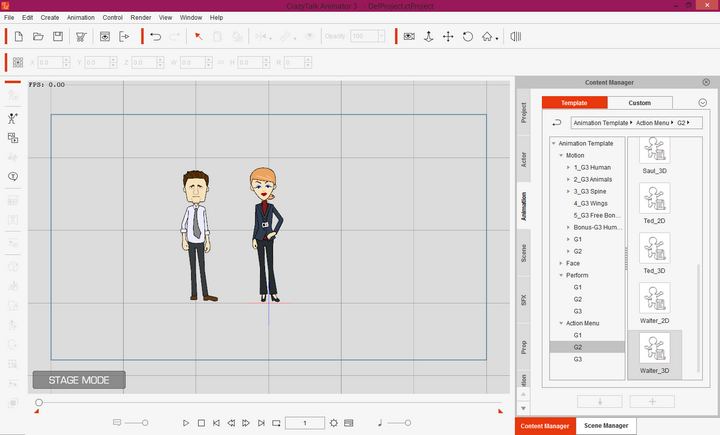 For the character part, CTA3 is built with 2D character templates, valuable motion libraries, a powerful 2D bone rig editor, facial puppets, and audio lip-syncing tools to give users unparalleled control when animating 2D talking characters for videos, web, games, apps, and presentations. Its early sister, CrazyTalk Animator 1 (CTA1) already had superb facial animation for animating faces inside photos and line drawings (still images of painting etc.) while in 2D. Now with CrazyTalk Animator 3 (CTA3) you can animate not just the face but the entire body as well and with a larger environment or stage. 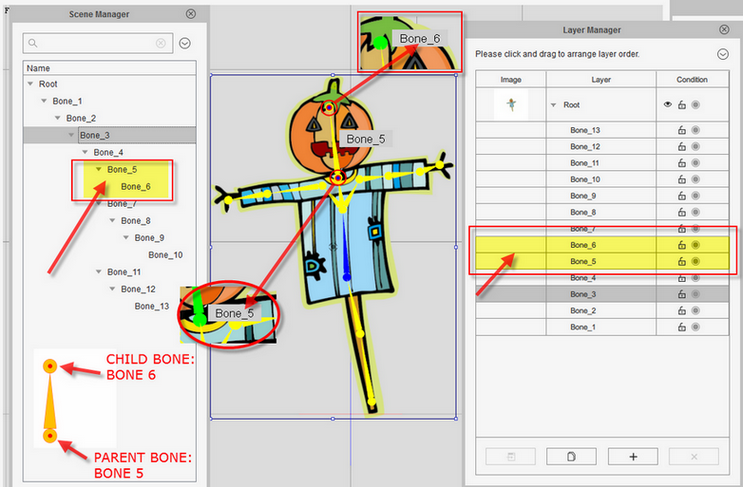 Reallusion has made CTA3 a notch higher making the user manipulate a 3D skeleton generating up to 10 different 2D view angles thus having the ability to use 3D animation tools to manipulate characters and allow them to interact with props/elements and other character as well while still in the appearance of 2D space. 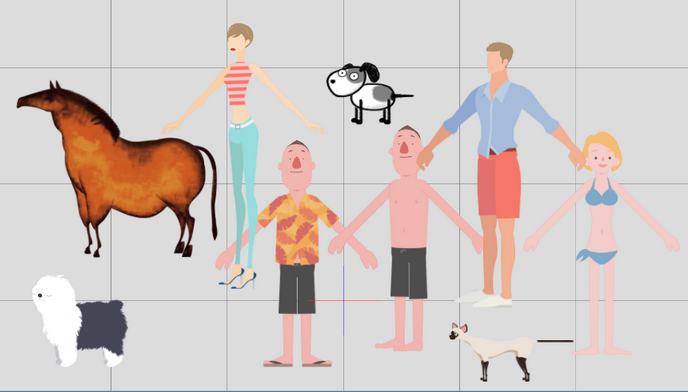 Take a look at the built-in characters I tinkered with (you can replace those with your own cut out photo or of the head/face or whole body) just to make you see the animation that you can do with CTA3. wwd, RGiskardR and LowcyGier like this. The main user interface is in 9 parts. 2 - Project Tool Bar -- where you can Open, Save, Create a new project, Preview an image of the current frame, or export your project. 3 - General Tool Bar --this is where you undo/redo actions, select characters/objects, merge selected props, duplicate character/objects, set actions such as flip, link, visible/opacity keys to characters/objects. 4 - Camera Tools Bar -- here you can switch between Preview Camera Mode and Live Camera Mode, zoom in/out of any scene, pan/rotate camera, switch to different view modes of the camera and go to 3D mode. 5 - Property Tool Bar --where you can view/use property tools for the character actors, props, sprites, effects to enhance the details of the 2D/3D animation project. 6 - Functional Tool Bar -- this tool bar you can use when switched to Composer Mode, create characters/objects, add voice scripts for the chosen character actors as well as generate motions/animations. This is also where you can modify text, render styles and the runtime editor for the characters of your choice. You can invoke key functions as Action Menu, Sprite Editor, and Puppet Editor, 2D/3D Motion Key editor and Layer Editor Panels. 7 - Preview Window -- which is the working area, where the character/props in the scene or project are as well as export the range bounded in the Safe Area can be observed. 8 - Content Manager -- (can also be accessed via F4 key), keeps embedded and custom content (presets/templates) you can apply to your project. The Scene Manager, displays all the character/objects included in your project. 9 - Play Bar --contains the basic playback tools at your disposal for previewing character actor voice, motion and background music applied as well as button to bring up Project Settings and Timeline panels. 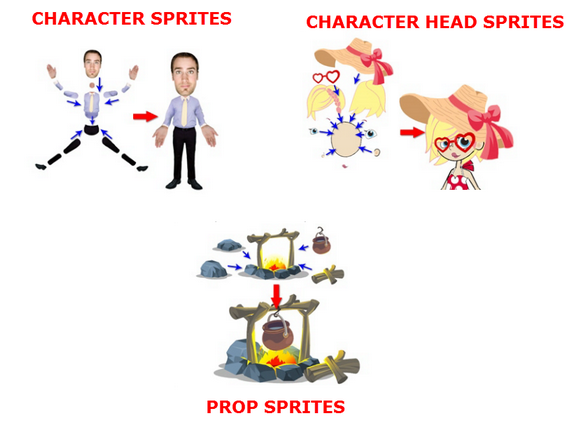 A "Sprite" is the elements in a character, head or a prop. CrazyTalk Animator characters are capable to perform dimensional motions and expressions which is generated by displaying the different components in sprites and within sprites that compose a character actor’s body/face. The sprites on the bones changes in relation to the angles specified or set so as the dimensional motion/expression is created. As seen in the image above, a sprite, can have multiple elements. Take a look at the body parts of the "character sprites", each part there or sprite composes that one character body. That's about 15 parts or 15 sprites there. Edit a texture of a sprite. Again take a look at the image above and each sprite is "exploded-blown-out" image of the body parts there. 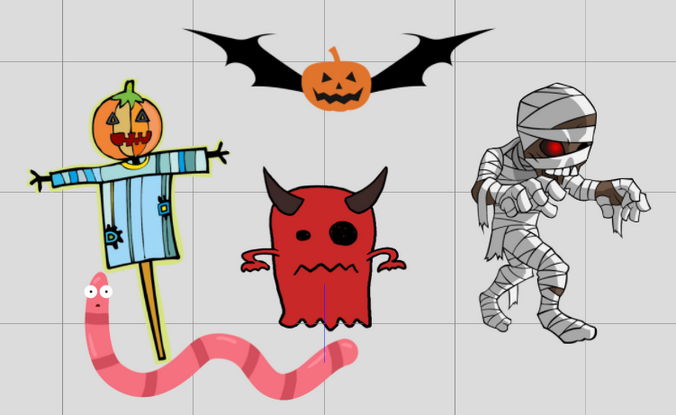 You can edit each sprite there and CrazyTalk Animator lets you go to Photoshop (or any image editor you have, just specify it in the settings) directly via the "Launch External Image Editor". From there you can do editing based on your preference. 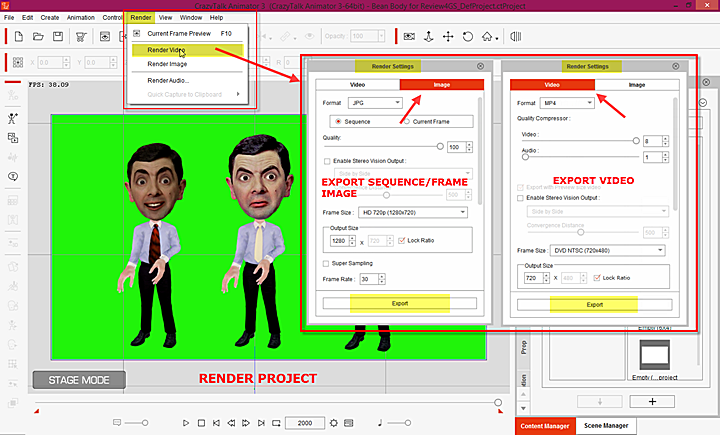 Later in the final rendering of the sample video for this review you will see that I have used this function to edit Mr. Bean's character to have a different color of necktie as well as edit of the face and facial colors. There are 2 main categories of heads in CrazyTalk Animator, they are; (a) Morph-based, and, (b) Sprite based. 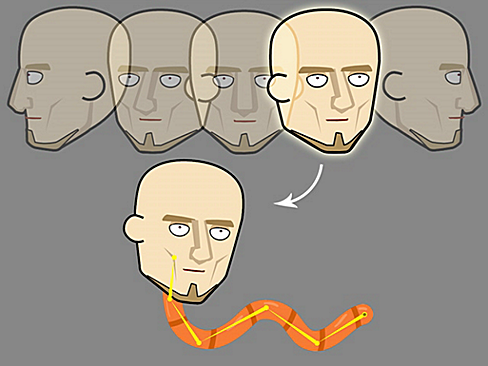 Morph-based head is done by projecting an image onto a surface with a dimensional and protruding shape of the face. The eyeballs and teeth are placed behind the surface. If you will create one from scratch it is done in the Face Creator. (a) Image -- in JPG, JPEG, BMP, GIF, PNG, TGA formats. (b) Video -- in AVI, WMV, RM, RMVB, MPEG, MPG, MPE, MP4, ASF, ASX, WM, FLV, MOV and popVideo formats. (c) Vector images -- SWF format. There are several kinds of characters in CrazyTalk Animator. They are; (a) G1 - which is CTA ver1 characters, (b)G2 - which is CTA ver2 characters, (c) G3 - which is CTA ver3 characters, and (d) Free Bone Characters (ver 3 also). 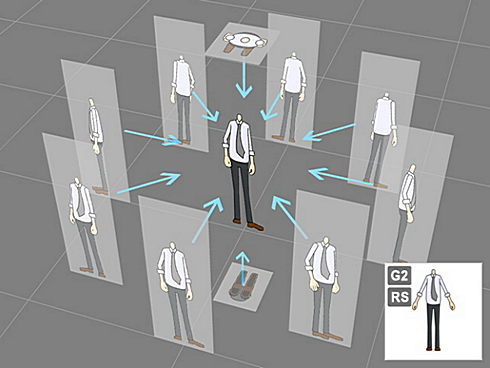 G1 characters are designed facing either front or side views as implied in relation to the direction of the characters left feet. Most of the G1 sprite-based-characters of this type that are seen in the Content Library (preset/templates) are version 2 or above. They are converted characters to suffice for G1. G1 characters are basically flat with a single view (from and side only). The perspective of the 9 other angles use this view (front/side) as reference. On the other hand, G2 characters and above have 10 angles. G3 characters are built with fixed regulated bone structures. This is a "bone-rig" arrangement. G3 characters are divided into G3 Humans, G3 Animals, G3 Spine and G3 Wings. In the bone-rig arrangement, let it be noted that the "Parent Bone" or base bone is the one located at the bottom side of the triangle while the "Child Bone" is at the pointed one. That triangle that you see there is actually not a bone but an "indicator" showing the direction of the bone string and the bones connected to it. Please see image below of a "Free Bone Character". Bone 5 is the "Parent Bone" and Bone 6 is the "Child Bone". The "indicator-triangle" shows that Bone 5 and Bone 6 are connected to each other. 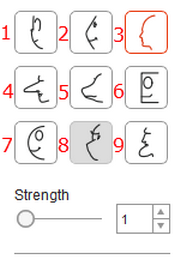 Free Bone Characters (ver 3 also) are built with "free structures of bones". Therefore they can be human or non-human. CTA says that basically "Free Bone Characters" do not have heads (though you can see they have there...) but you can attaches nay head as replacement for that matter there. That function is not only limited to Free Bone Characters but all characters of CTA as well as will be seen in the latter part of this review. 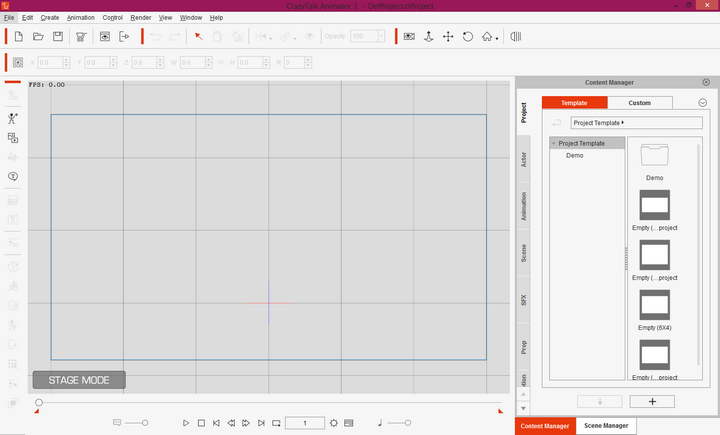 I will not delve on the intricacies of the CrazyTalk Animator Pro as this will be a full blown review warranting more than 20-30 pages and more time consuming at that so I will just make a demo project (for this short review) so you can see what CrazyTalk Animator Pro can do. To suffice, I will insert an tutorial video I always use. 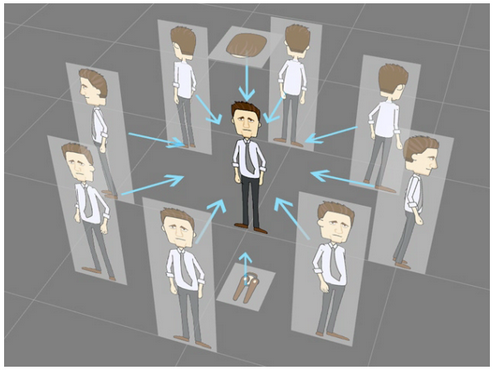 The video below can be used as a guide to animate a full-body image. Please see video below. CTA3 can bring 1D or 2D characters to life by simply adding facial animations at no particular steep effort beyond of what we may term as a newbies trial and error. Let’s make one here. 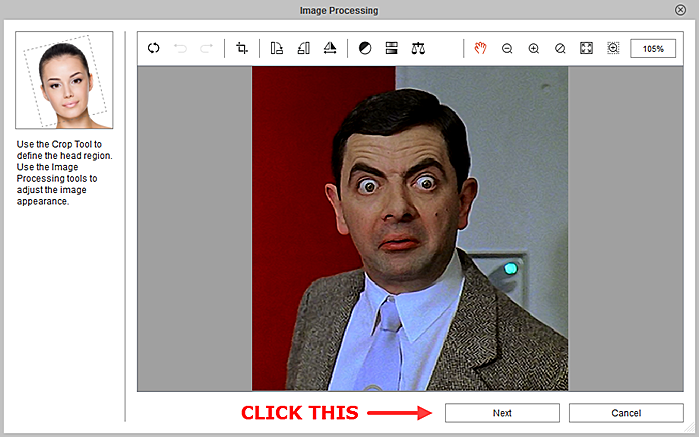 I made a screenshot image of Mr. Bean from an old movie I have and saved it as .PNG file. Now CTA3 has capabilities to crop/cut-out images. 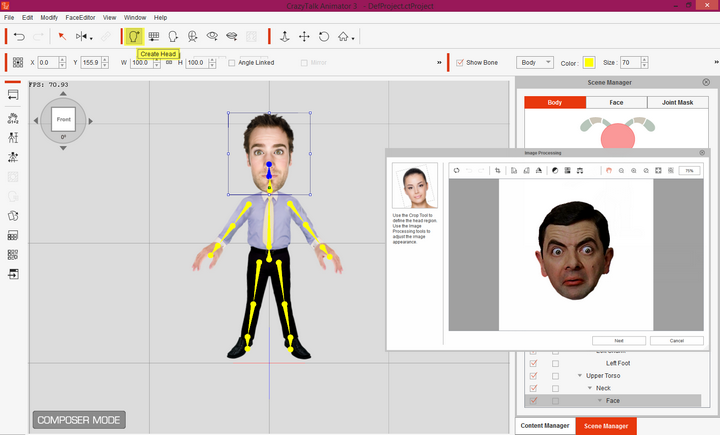 If you see the Mr. Bean image I will use, it is cropped like a mugshot with the neck and shoulders but I can cut out just the head portion in CTA3 but for this review I will use Photoshop to do that for me as I work much faster with it. Also CTA3 has integration in Photoshop and when you are in need to edit something you can just "Launch to External Image Editor". When you open CTA3 it will open in its default "Stage Mode". You can also drag an image file directly into the CTA3 interface (like Photoshop) and it will automatically bring you to the "Composer Mode". 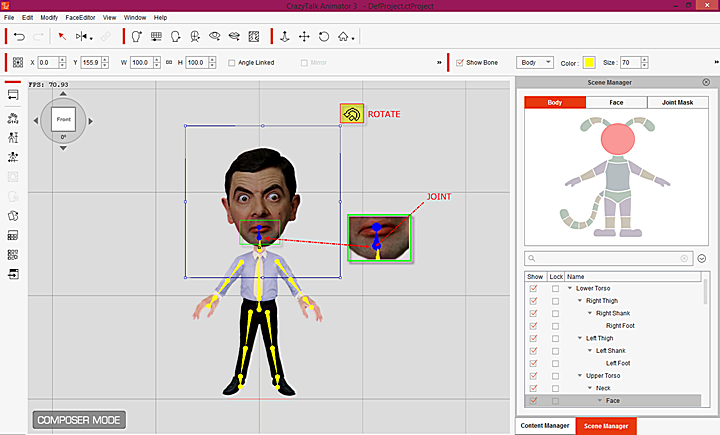 For this short demo of face animation I will go to the Menu Bar > Create G3 Free Bone Actor > Select the image of Mr. Bean. Doing so will open the image in the "Composer Mode" with the "Bone Editor" dialogue in view. Since we are not creating a bone on the face (well you can if you are imaginative) I will just close the "Bone Editor" for now. 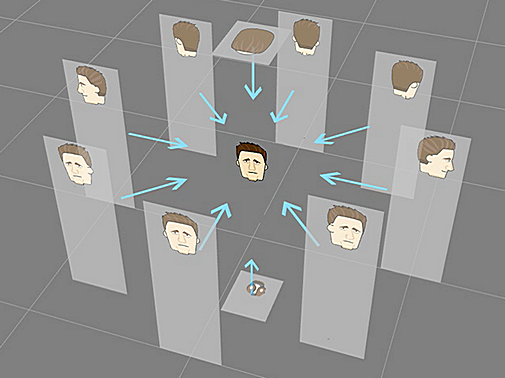 With the image selected (selection points are seen in "blue") I need to convert it to a "Morph Based Head". 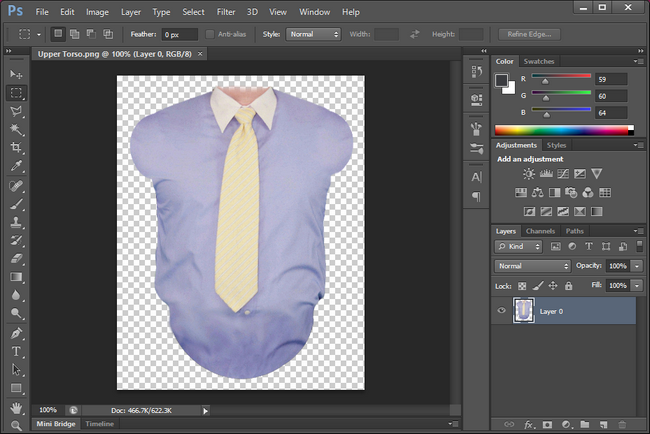 The Image Processing window will appear and it is there where you can crop, rotate, mirror and adjust color levels. For this part I'll just proceed to Click "Next" to go to "Auto-Fit Anchor Points window". 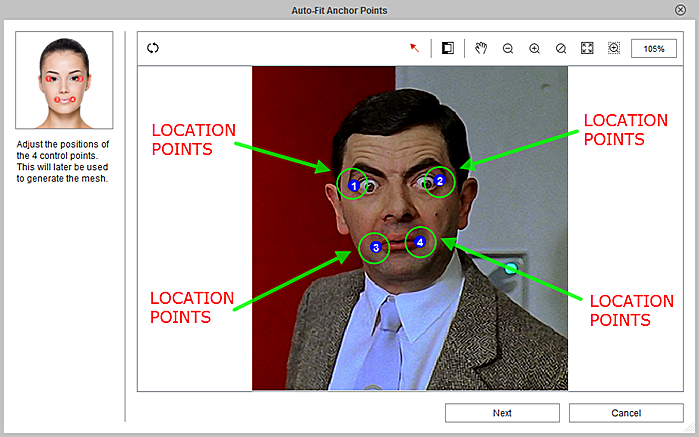 In "Auto-Fit Anchor Points" window this is where you place the 4-point auto fitting which will act as the base frame to fit the face of Mr. Bean. You just have to drag the location points 1-4 to the edge of the eyes and mouth and that's it. You can zoom in the eyes/mouth so you can place it more accurately. 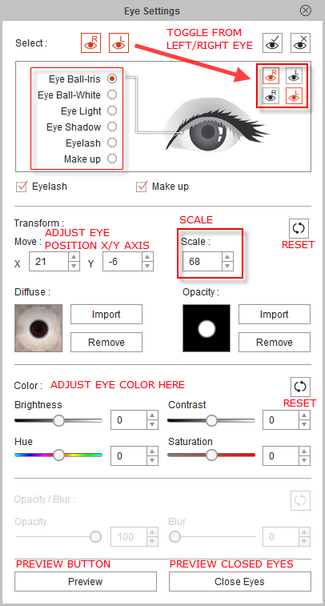 It is imperative to adjust/place the location points as accurate as possible to get the best fit for the eyes and mouth. There is a "reset" button if you make a mistake and want to start fresh. 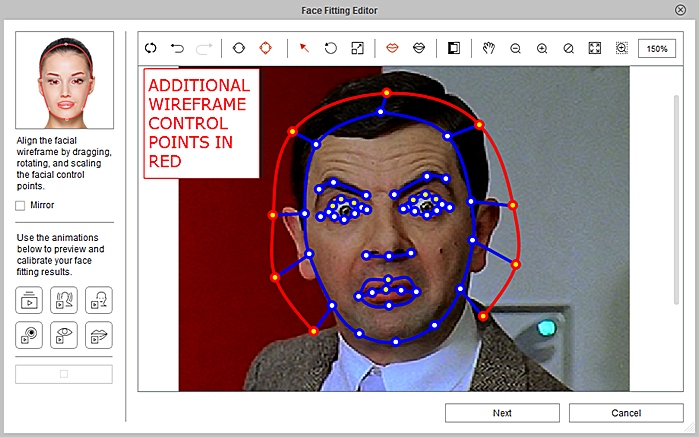 The "Face Fitting Editor" helps you to frame up the facial features of Mr. Bean's face via wireframes. Placement of the location points must be precisely placed as possible as it will affect the result. There is a zoom tool that is advisable to be used always so the precision of the drag-points are place properly. Again the reset button is there if you need to start fresh. Let it be noted that the "Face Fitting Editor" has 2 facial modes: (1) Basic Facial Mode (which is by default the first that pops-up and the (2) Detail Facial Mode where there are additional points that you can drag/set so wireframe more precisely. 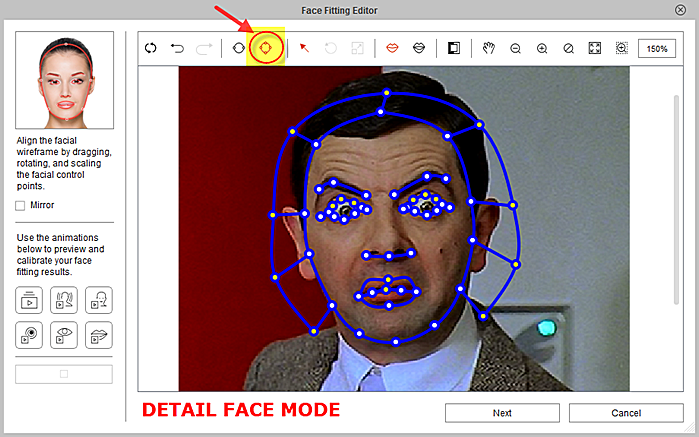 If you will closely look at the comparison images of Basic Facial Mode and Detail Facial Mode there are additional wireframe control points with the latter to fit Mr. Bean's face more precisely with the inclusion of the outer control points for the crown for the hair/ears alongside the additional control points for the eyes, nose, mouth, and the peripheral of the face. a) Middle control point of the eyebrow and the middle control points of the upper/lower eyelids. If there is an open mouth like this image (and you want to retain it) you can set it to have an open mouth by adding more wireframe points to it. 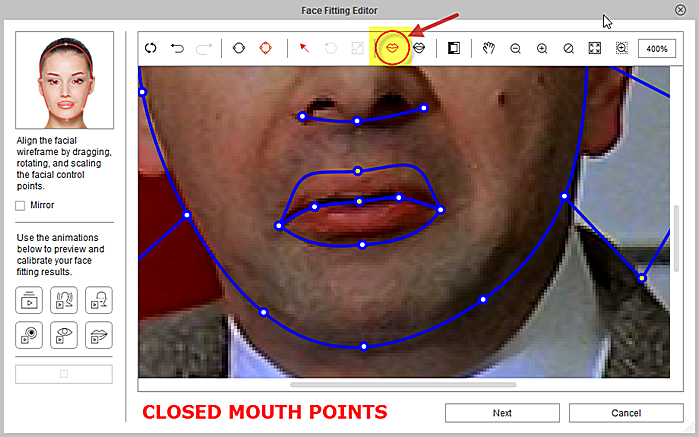 The "Open Mouth" points and the "Close Mouth" points are at the top of the Face Fitting Editor menu. After setting all the wireframe control points as accurate as possible I have to view it so I can gauge where I am. Calibration Buttons" are provided for that matter. There is a "calibrate all" (the first of the 6 calibration buttons) that allows you to preview the end result based on what you have set. 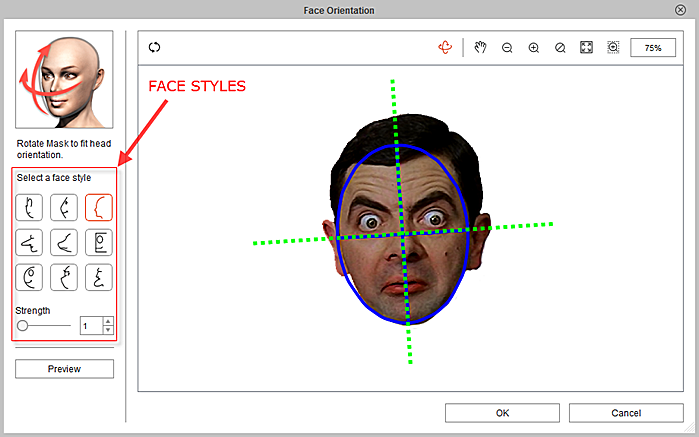 Now we have to define the "Face Orientation" of Mr. Bean. 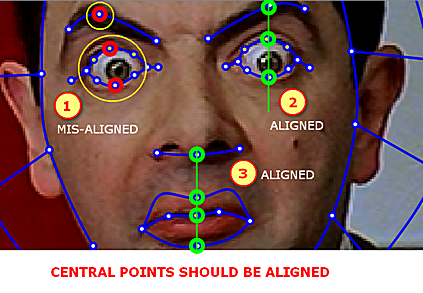 The Face Orientation is where I will adjust the profile style of Mr. Bean and then afterwards define his face orientation. It must be noted that the axis should fall at least at the center of the face. There 9 basic profiles to choose from there with a Strength slider which can adjust the accentuation and motion of the character. A high value accentuates more the profile and motion of the character chosen. There is a preview button so you can choose what is best for your character. As with mine, Mr. Bean I set to 1. 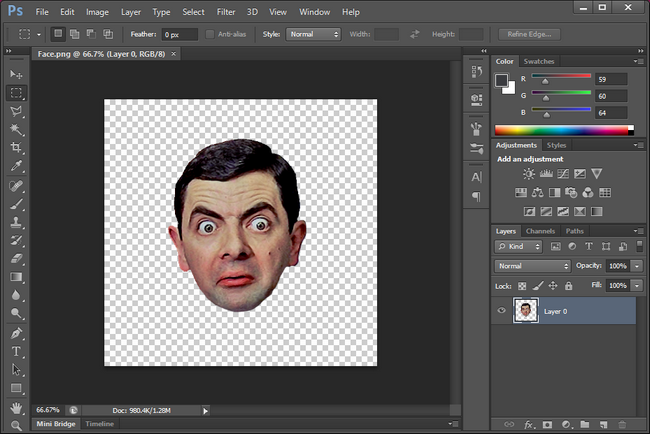 Please see sample animation of Mr. Bean's face below. I applied a random preset face animation of "Cry" just to make you see the end-result based on the settings I made earlier. See below. Better results can be obtained if the face you selected is facing front and if mouth closed and of course if the photo/image of the face has been cut-out from the rest of the other parts of the images (the background of Mr. Bean is also moving in relation to the animation done) but frankly it’s in the imagination of the user and how can he make it work out. Just wanted to show you the possibilities there. When I started this trial there was a lot of trial and error but not too much as to make you stop and pull the plug. It gets more interesting when you do it. And one thing I'll promise you there will be smiles and laughs in between checking out/applying animations to your project especially when you have recorded it and view the end result. 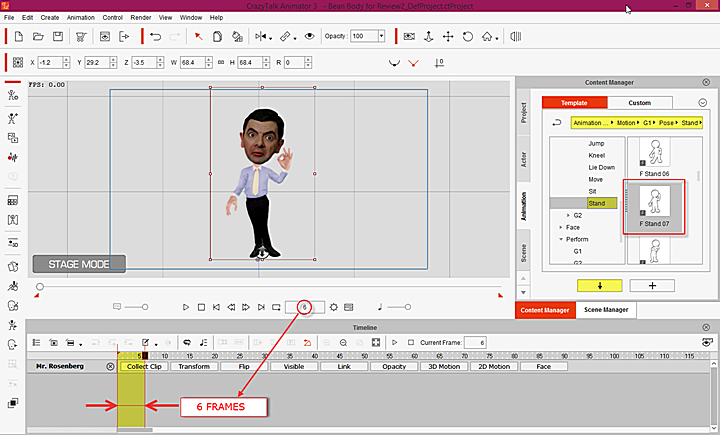 AS mentioned earlier you noticed that I have not cut out the head of Mr. Bean here but in the next demo I will use a cut out image of Mr. Bean I did in Photoshop and attach it to a cartoon body. Let it be noted that you can also you can apply a voice to Mr. Bean's head. I will not delve on this in detail but I'd just like to show you a one way to do it here. In "Stage Mode" you go to "Create Script". The "Create Script" will show you options listed below. The options are pretty self-explanatory there and the fastest way is to record your own voice or use TTS (text-to-speech --which uses Microsoft Speech Platform). If you have some application that can alter your voice like, AV Voice Changer Diamond or MorphVox or know how to tinker with a sound editor to make some spectacular voice in the likes of Samuel L. Jackson or Morgan Freeman then good for you! I don't have one so I'll use "TTS". I know all you get the picture here. Your imagination is all you need! 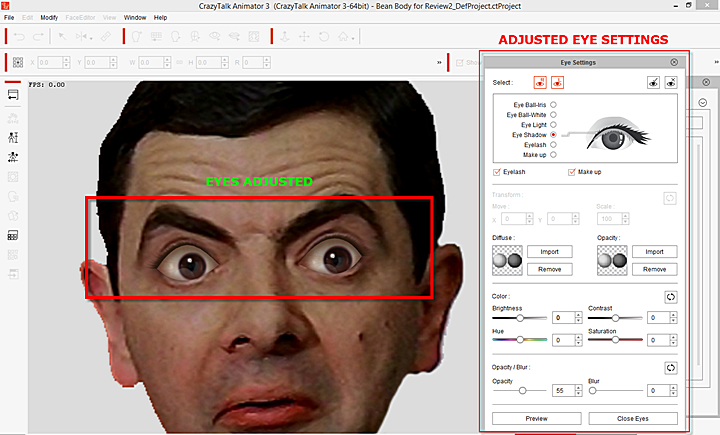 For this part of this short review I will use a cut out of Mr. Bean's head I did in Photoshop and attach it to a preset character actor in CTA3. The first thing that I need to do is to select an "Actor" in the Content Manager. There are a lot to pick out but for this lets me just pick a G1 character "Mr. Rosenberg" from the list and drag it to the "Stage Mode" interface (Actor Template>Character>G1>Human>Mr. Rosenberg). When you drag/load an Actor from the character template a corresponding actor angle is needed. For this I will just select "0" degrees to keep it simple. Thus my character will be facing me. But you can select whatever angle you want from 0 to 180 degrees and 0 to -180 degrees. 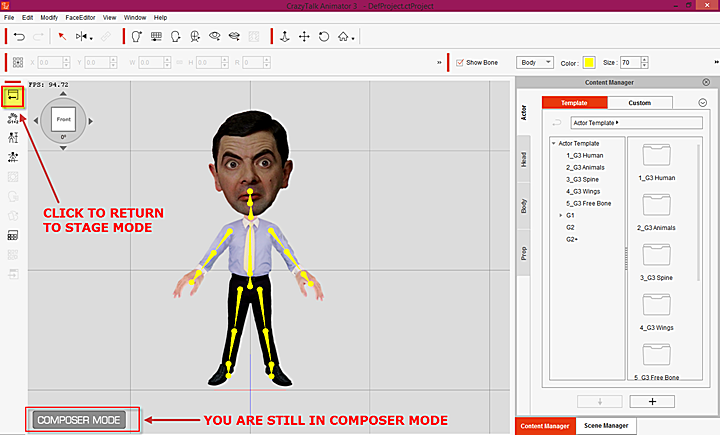 From there I need to go to the "Composer Mode" so I can start attaching the head of Mr. Bean. 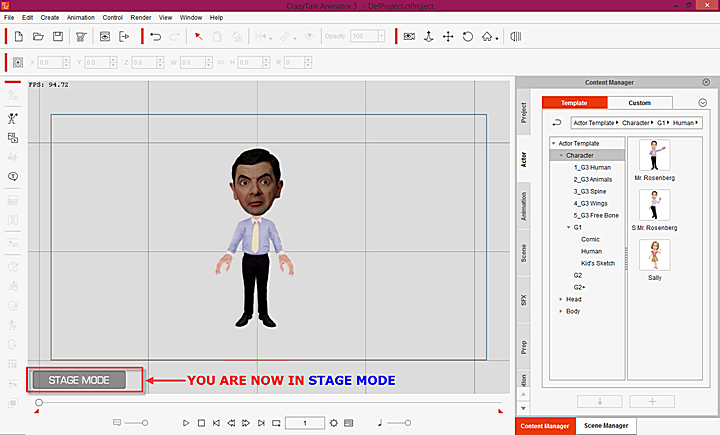 As the character actor (Mr. Rosenberg) is placed in "Stage Mode" interface, I need to go again to the "Composer Mode" so I can replace the head of "Mr. Rosenberg" with that of Mr. Bean. 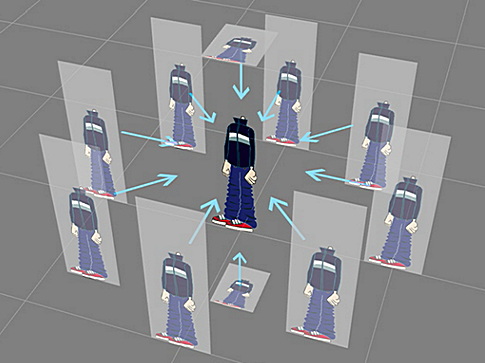 The head of the character actor must be selected (when selected a "blue" selection square" is seen) to remove it. You will notice that there is "blue thing" in front of the actor character head. That is the "face bone" because selecting a part of a character highlights the "partner-bone" as well. 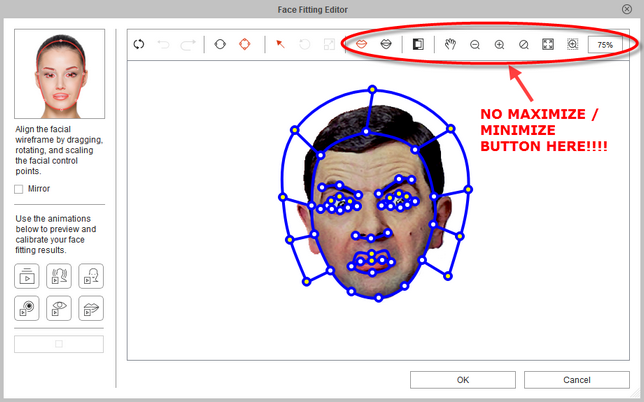 After selecting "Mr. Rosenberg's face" and clicking the "Create Head" icon a pop-up will appear asking you "if you want to save the face file before fitting". I will select "No" so it will not interfere with Mr. Bean's face later. 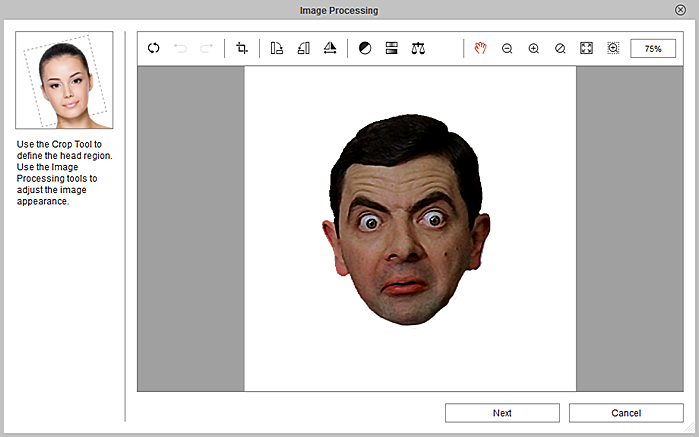 From there I will select the location of Mr. Bean's cut-out face and it will automatically be transferred to the "Image Processing" window. 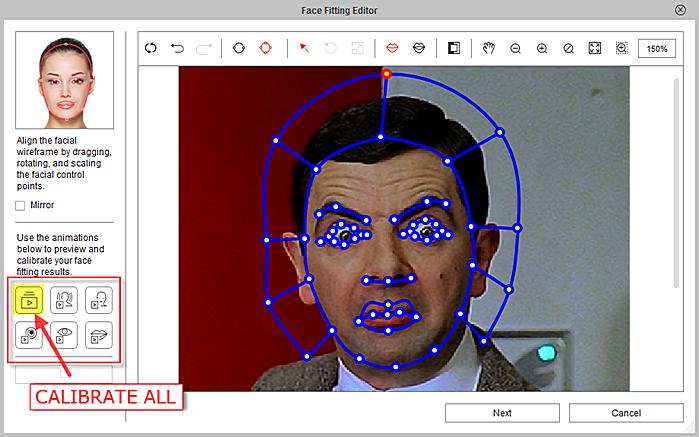 The 4-location points to anchor serves as the basis for the wireframe face fit in Face Fitting Editor. 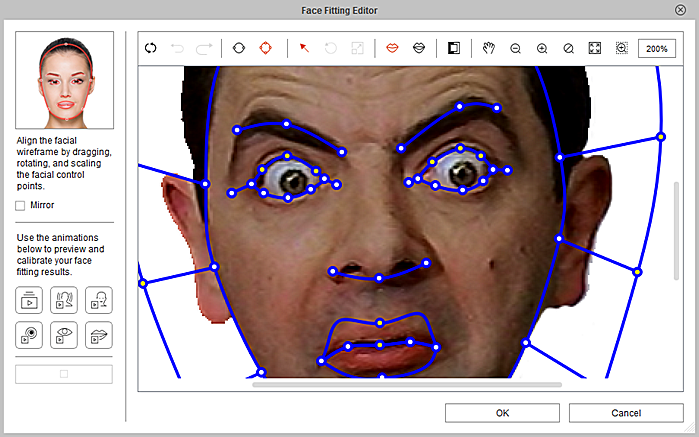 The Face Fitting Editor will allow you to set wireframes control points to frame up the facial features as accurate as possible because it will affect the end result. Let it be also known that it is better to place the control points as precise as possible in the "Basic Facial Mode" so that when you go to the more detailed "Detail Facial Mode" you will only have to set the additional control points to save time. A "reset" button is provided if there is a reason needed to start fresh. After setting up the "Face Orientation" (that's about all of it for the wireframe basis for the whole face of Mr. Bean) you will be brought back to the "Composer Mode" interface where you will see Mr. Bean's face has completely replaced that of Mr. Rosenberg's. Now you will notice that Mr. Bean's head is somewhat a bit lowered and seems to be placed below the neck and actually has extended towards the chest area. So we have to fix that by adjusting Mr. Bean's head to be placed just above the neck. To do that you have to double-click the face (notice that the blue selection square will be replaced by a green selection square). You will also notice a new window which is the "Sprite Editor". We will ignore that for now as we are not going to do any edits to the sprite. 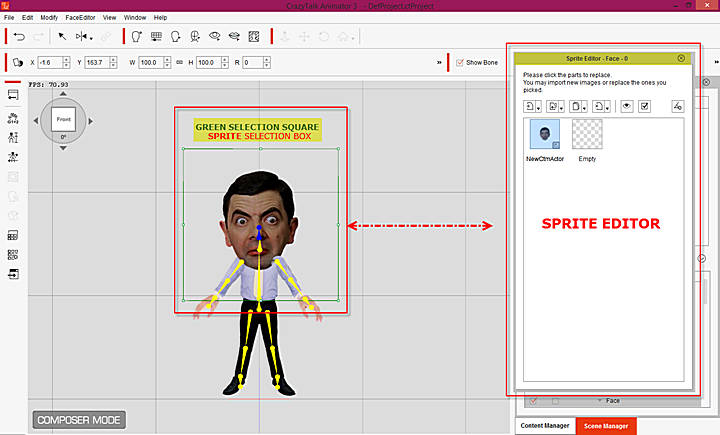 To adjust Mr. Bean's face to proper location, pull the face selection (that green selection square) up towards the location of the neck. Just have to pull it up a bit so the neck is seen. After that close the "Sprite Editor". 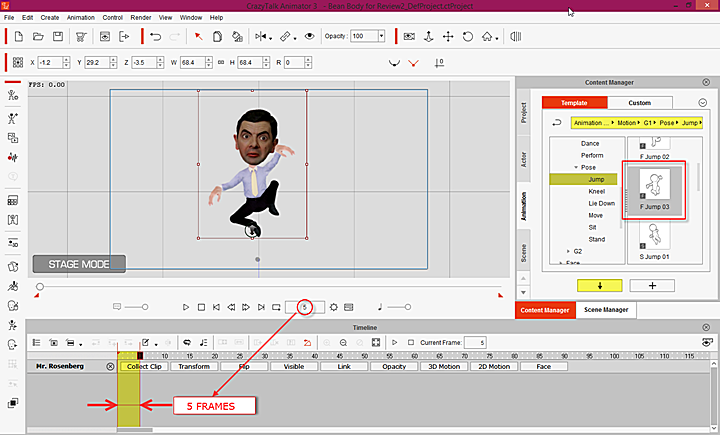 You can check how the Mr. Bean's head is now properly attached to the (former) body of Mr. Rosenberg's by selecting Mr. Bean's head and dragging the rotate/swing icon. Now that we have adjusted Mr. Bean's face to its proper place on the neck. The eyes and the mouth need to be set. Let it be known that you can opt to not set the eyes and mouth/teeth and it'll still be a pretty good animation but for this part we will set it up so all can see what can be done on the eyes, mouth and teeth. 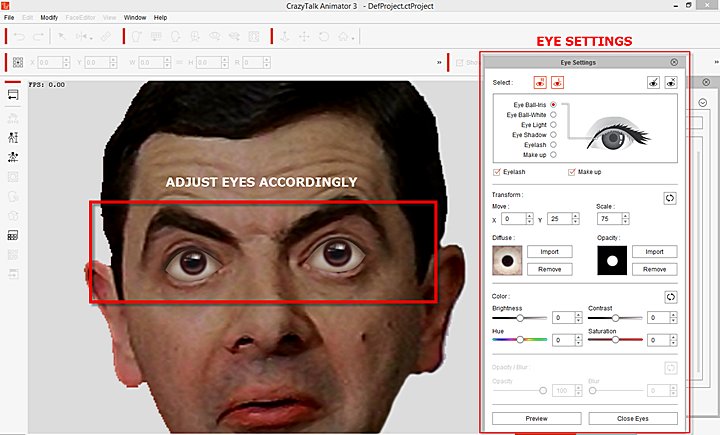 To adjust/replace the eyes with the built-in presets of CTA3, you have to select "Eye Settings" and select the appropriate "eye" that will closely resemble the natural eyes of Mr. Bean. 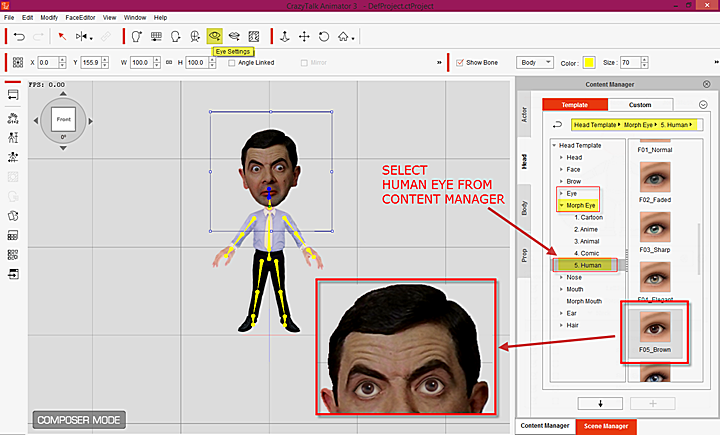 I will be doing this to at least make a comical view of Mr. Bean's face (as mentioned earlier you can opt not to but the eye movement when you animate the face will be affected thus I will do it). Adjustments are pretty much simple but it must be noted that it'll be good if the eyes are adjusted first by selecting both left/right eyes and scaling and adjusting the color both at the same time. Afterwards you can proceed to adjust "per eye" basis. There is the X/Y axis where you can use the up/down arrow to set it up as well as the other settings with sliders such as the color adjustments etc. I will not delve into much detail here. The mouth and teeth adjustments are also pretty much simple (and I too will not delve on it deeply). During the “Detail Face Mode" I have set the mouth as closed although there was additional control points set for an "open mouth". 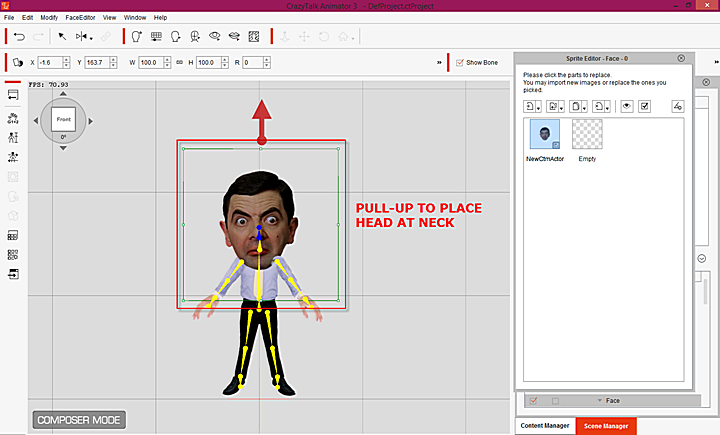 It will not be seen much as when Mr. Bean's face (as attached to the body) is taken out from the Composer Mode to Stage Mode because the size is small. But to adjust with the least possible tinkering the "scale" should be done first based on the open mouth given. Adjust the X/Y axis (up/down arrow) so it'll be relative to the mouth position. The other settings with sliders such as the color adjustments etc. Below is a tutorial I'd like to share in this regard. So at this point we have attached the head of Mr. Bean to the character actor-body of Mr. Rosenberg successfully. The next step is to animate the new character we have created. There are different ways to animate a character in CTA3. Depending on the character chosen you can either do it from scratch, use a preset template or use combinations. The "Body Puppet" provides a wider range of movements for you and to top that you can edit it to suit your taste. In this demo/short review I will not use it but use presets instead. But just to make you have an idea of what "Body Puppet" can give you kindly see video below. So going back to Mr. Bean. What we need to do is to exit the "Composer Mode" and go to the "Stage Mode". CTA3 has many presets for Animation. So I will use that to make Mr. Bean move. Applying an animation movement to a "selected character" also automatically records the succession of movements or animations that you apply to it. I used the preset template G1>Pose>Jump and G1>Pose>Stand just to show you how Mr. Bean will be moving (a sort of a dry run). By default the "Stage Mode" hides the full "Timeline" and you need to click the "Timeline icon" to show it. See image below. 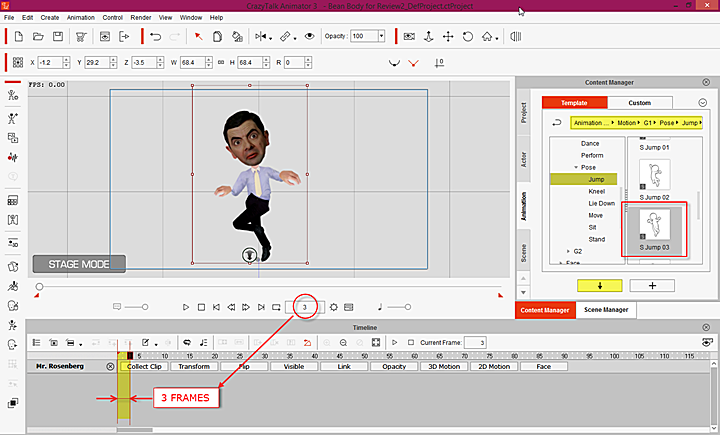 To apply a preset animation, you have to select the character, which is Mr. Bean, and select the preset template, in this case, G1>Pose>Jump>select the animation and G1>Pose>Stand>select the animation. See images below. If you will see in the images, the total animation frames of all the G1>Pose> animation only took 6 frames. So that's pretty fast. I just want to show the succession of the frames there. But in CTA3 Pro there are built-in animations that you can use for any project that you want to do. So using them I will try to make Mr. Bean dance. Now you will see that the background there is green. I have dragged a green-background I did in Photoshop so I use that as a "green screen effect" and later assist me when I want to render the finished project in my video editor. 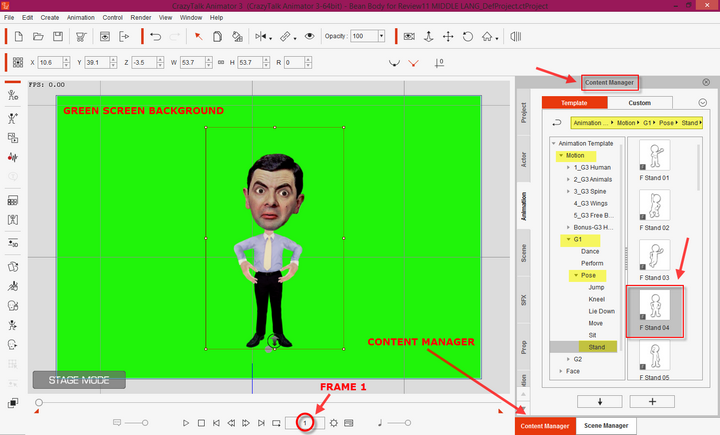 So Mr. Bean should be selected (a red selection square will appear) and I will go to Content Manager > Animation > Motion > G1 > (select animation preset). The selected animation are listed below. Looking closely in the images, you will also see face key details that were done after the application of the body animation. 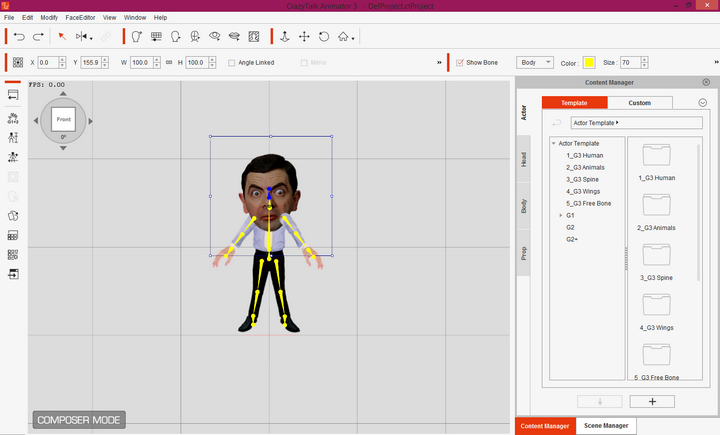 So to do some facial expressions (after setting the appropriate body animation for the dance steps) I will need to select Mr. Bean again and go to either (a) Face Puppet, or (b) Face Key Editor. 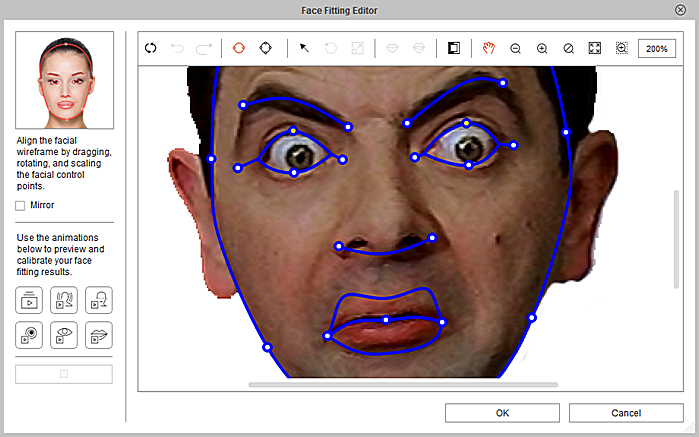 I chose Face Key Editor to get more granularity. Each "Expression Style" can be further edited to your preference via the "Detail Settings > Face Key Detail Settings". In "Face Key Detail Settings" you can set whatever you like in the categories: (a) Brow, (b) Eye, (c) Nose, and (d) Mouth. Sliders are provided for you to either increase or decrease the settings. 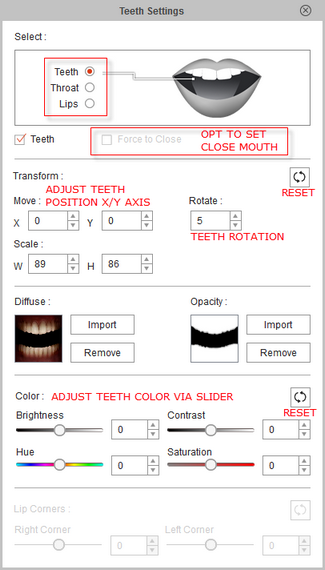 The "weight" or gravity of the facial expression can be set also via sliders at the bottom part of the "Face Key Detail Settings". Of course there is a "Reset" button when you need to start fresh. So at this point we need to export all that we have done with Mr. Bean so you can finalized your work. Let it be noted that you can finalize that particular work inside CTA3 Pro itself, apply background, music, props etc. But I chose not to as it will take too long for me. You know the trial and error stage again. 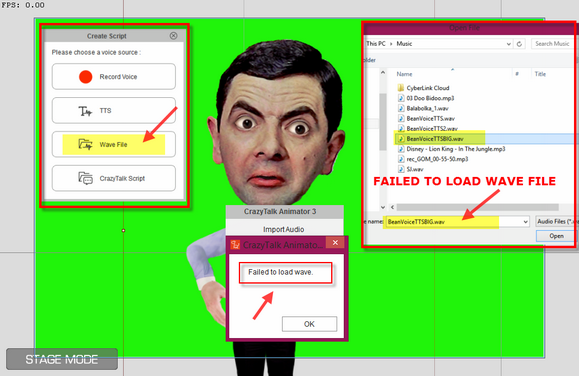 So I chose instead to export the animated Mr. Bean to a video file and work it out in a video editor of my choice. To do that you need to go to the "Main Menu > Render Video". Doing so will give you options to render in, (a) Video, or (b) Image. I will not delve into this but will just select, "Video" and set it at .mp4, sample audio and at DVD NTSC (720x480) frame size. See images below. There are a ton of things you can do with CTA3 Pro. All I used are the presets that came with it and the end result looks pretty good to me. Well not that I've not done some animations before but on me it’s pretty darn good. Kindly see the final video I rendered in a video editor. I have added some effects/sound tracks so it would be a bit nice to the eyes. So here ends the demo of what I intend to show you of some of the capabilities of CTA3 Pro and what you can do with it. Again there are a ton of other things that you can do up to rendering a whole 2D animation that you can do like that of the cartoons on TV. Your imagination (and of course time) is all that's needed. Just want to mention some observations below. Ease of use and learning curve is low to medium effort only. Yes! Absolutely. This is by far the most easy to use for me as compared to After Effects and Blender. The presets are superb and if you need more of them you can opt to purchase add-ons to CTA3 Pro. For the first time to novice animator CTA3 Pro will be an easy way to be immersed with 2D/3D animation. Tutorials and User Guide is readily available. Detailed too! If there is one thing that I hate when using a "new" software it is the absence of "help file", reference materials like instructional videos, user guide manual and the like. 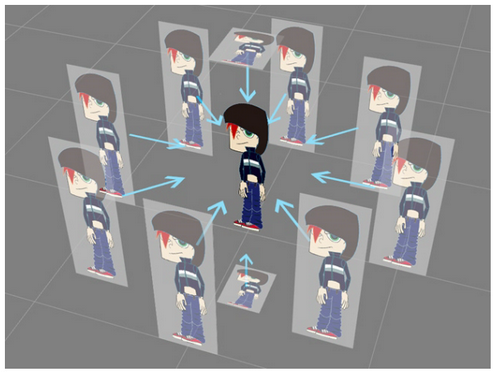 You never have to worry about it with CrazyTalk Animator because Reallusion has provided you with all you will need! This I give top marks here! Yes! Great materials. The Reallusion guys have anticipated the need and have readily stepped-up and made it easier for the user. Hats off to the devs! Tech Support is very attentive. The Reallusion tech support guys are very attentive to your needs. Issues on license activations, product upgrades, technical aspects of the program, etc., name it and they will help you out! The Reallusion forums is also there to lend you a helping hand when making some project of your own. Plus there are a lot of free finished characters, components, animation, etc., that you can download there. Yes, you heard it right, "free" from the contributing members. Hats off again to you guys! The Photoshop/After Effects guy I am always wants a "Maximize/Minimize" button. CTA3 has none. At first it was a bit frustrating to move around that tiny space allotted for you to edit in the "Face Fitting" and "Face Orientation" window. All you have is the "Pan", "Select" along with the vertical/horizontal scroll bars. That's it! So you need to adapt to it. There is "NO" right-click function that I saw (well at least on my experience --have not yet "fully tried all functions yet") in the "Composer Mode". Yeah! That really surprised me there. The right-click functions I used was in "Stage Mode" only. Now I am familiar (at least) with a lot of software by now especially drawing/rendering applications CAD (AutoDesk AutoCAD etc. ), Adobe software, Corel etc. and all of them have the right-click function. I got to mention CAD because of the ton of the functions that it has while you are doing some drawings/dimensioning you really cannot go to the top panel and use the icons so the right-click function is much needed. You can also set what you want to be included in the right-click function. But to be fair, that's AutoDesk. Here in CTA3, you cannot use much. There is the "Content Manager" and "Scene Manager" where you can view all that is needed but to me it’s still a necessity to have a full right-click function to help the user. It makes life easier. I wanted to use an "altered voice" in replacement of the plain Microsoft Speech in Create Script > .WAV File. So I searched the net for a freeware voice changing software. I found "AthTek Voice Changer" (http://www.athtek.com/voice-changer.html/) downloaded and used it. 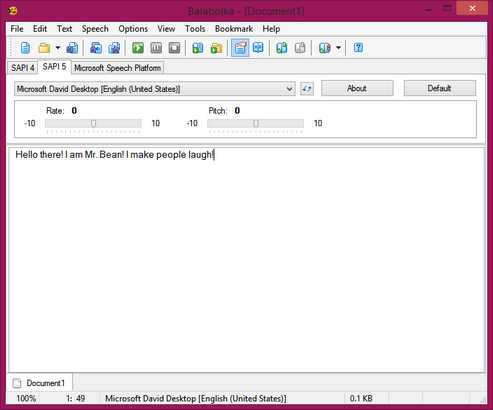 It’s pretty good and had altered the .wav file of "Microsoft David Desktop voice" I made via a 3rd party Text-To-Speech software "Balabolka" (http://www.cross-plus-a.ru/balabolka.html). So I checked and played the .wav file via PotPlayer.exe and it was pretty good, loaded it to freeware "AthTek Voice Changer". Used a "heavy" voice tone and exported it as .wav file. To check I tried it with PotPlayer.exe again. Good and everything was okay. But when I went to Create Script > .WAV File it did not load. I wonder why that is...Tried everything but it always failed to load. So I just stopped and used "Microsoft David Desktop voice" for the demo instead. Stage Mode "Remove Object Animation" removes ALL animation. Now this I learned the hard way. I thought that when you use that right-click function in Stage Mode > Remove Object Animation it will just remove that part of the animation you want to remove. Bzzzt! No! It will remove ALL your animation. And I mean all that you have used from when you started applying animation! Even if I have placed it on the frame from where that I wanted to remove the animation. It will remove ALL your animation. That was frustrating. It was like resetting. So I had to start fresh and "Save" my job more than needed. It might not be the proper way of doing it (Stage Mode > select character > Remove Object Animation) but the new user in me does not know it yet. So in tandem with "saving" my work often, I make it a point to use the "undo" button and not just remove object animation. I still have to check how I can remove just a part of the animation that I do but this has been a long one already. 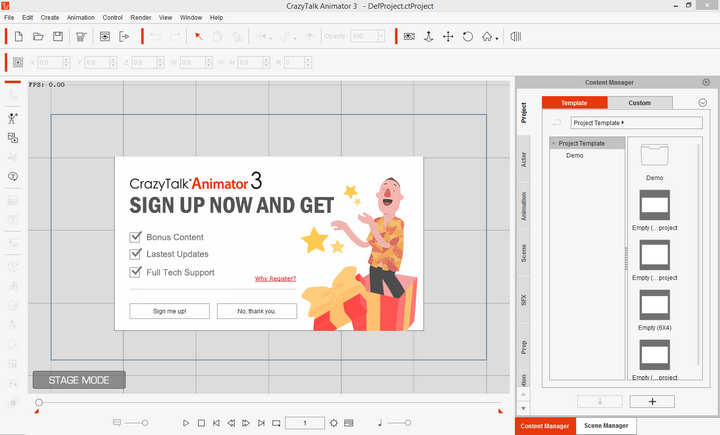 CrazyTalk Animator (CTA) is the easiest 2D animation software that enables all levels of users to create professional animations with the least amount of effort. CrazyTalk Animator is one spectacular piece of software that I have encountered since I tried making some small animations last year. This is a first time I have made pictures/photos talk, attach a photo-head to a character body and make it move and dance! Frankly I was amazed that you can just do it with a little less than medium learning curve. It's a fun piece to use! 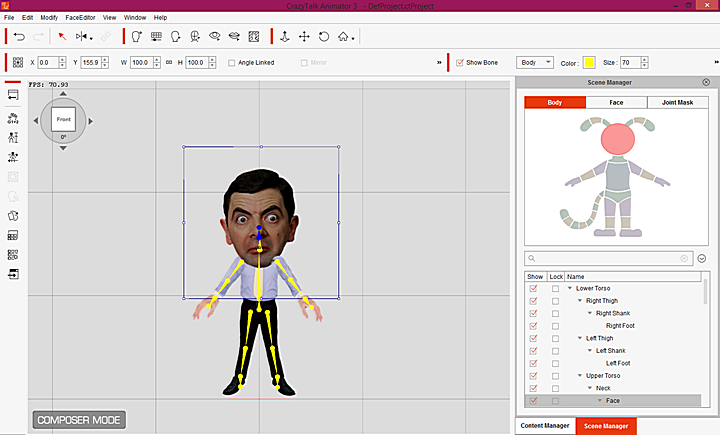 I even laughed at Mr. Bean as I tried all sorts of animation to his face and the character body I used. I have not tried the whole functionality and capabilities of CTA3 Pro but this review made me more interested to try to learn it more and use it. As mentioned in the review/demo, your imagination is all you need and from there you can improvise and make do from that. The finest aspect of CrazyTalk Animator is its ability to be as easy to use and if you need it, be more complex, depending on your project and of course your imagination. I mean after some tinkering creating characters with CTA will be as easy as pie for those of you reading this. 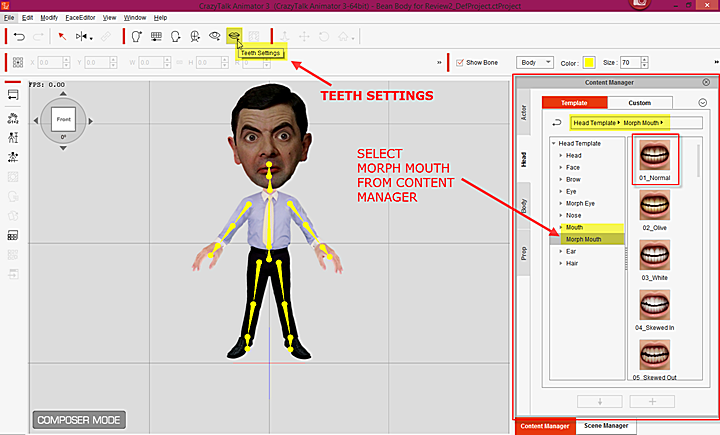 The face animation via "Face Puppet" or "Face Key Editor" is great with its ability to edit facial features to your liking and use auto-lip sync/apply a voice (well I have not tried fully that yet, using my voice to apply it to Mr. Bean as I have issues with my microphone now the reason I used TTS). Body animation via the puppet mode offers more granularity and expression of movements accentuating the face and whole character. Using that with the preset animation will definitely give more to view in any of the projects that you will be doing. One of best part also for new users is even you do not know how CTA3 works the materials provided are there with just a click of the mouse. Well the "help file" is online but you can download the user guide/manual and instructional videos. It’s all you need to jump-start any project with CTA3. Just have the pictures/images and know what you want to do (or what you have in mind with those images), you can start in a jiffy. 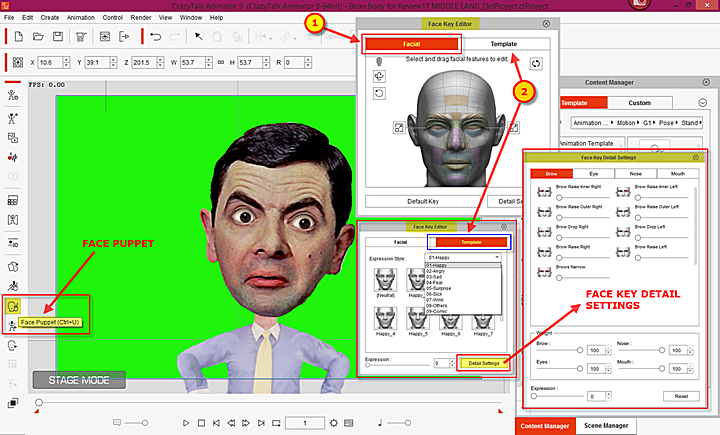 CrazyTalk Animator can also be used in making instructional videos and guides. Yes indeed definitely! It will be a great tool used for educational purposes with all the confusion running around kids minds, kids will definitely be watching any CTA made educational video attentively especially that it will be created with, say, cartoon characters like Batman or Iron Man! I'd watch it! This can be an invaluable tool for educators! Content resources to further your needs are available at the Reallusion site for a price. So to those who can shell off some hard earned money to give your animation more "wow" feature you can just go to the site and avail of the discounts there. Every new version at the content store is offered at a discounted price. Always! For those who are in medium-to-intermediate or intermediate-to-(to be) professional CrazyTalk Animator will definitely shine with your preferred arsenal as it can be used in conjunction with other animation software. To those who have experience using other animation software applications like Toon Boon, Moho Studio Pro or After Effects and the like, CrazyTalk Animator is pretty much at par with them. Don't get me wrong there this is based on my opinion only as a first-time unprofessional animator (sort of, --speaking of just After Effects and the freeware SynFig Studio). CrazyTalk Animator has the potential to be one of the best animation software out there in the market. Has yet to be proven as a very serious one though because in my searching and asking around, not any major animation studios use it to create or supplement their shows. But I cannot deny the potential because CrazyTalk Animator's features are impressive even-though a relatively new player. As mentioned the ease of use along with its motion libraries/presets and facial animation/distortion are what it makes it a great animation tool. Definitely the time to create an animation is cut in half while having fun doing your project. 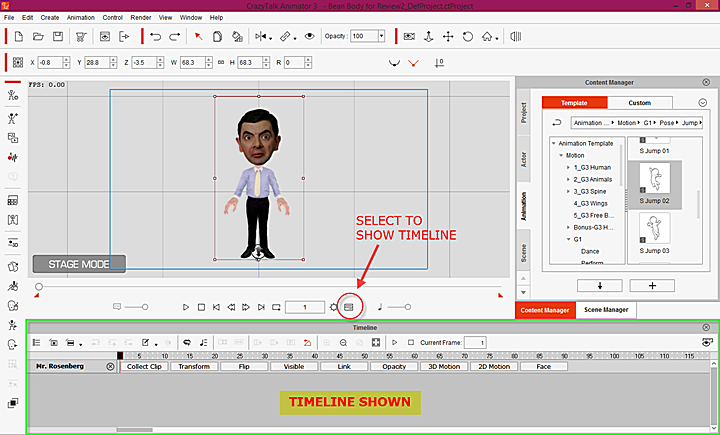 CrazyTalk Animator is easy to learn and more than sooner will have you animating your own creations at the same time mastering the program as you go on using it. Of course the "quality" of any cartoon or animation is really in the skill of the user or the "animator". In any endeavor it is really the skill of the user which dictates the end result. I feel and believe that in using CrazyTalk Animator there is no means preventing you to make "professional" quality animations partnered with a good video editor with good effects in tow. The possibilities here are "not endless" BUT very good. Hell, it also hit me that animations done in CrazyTalk Animator can also be used imported to Incomedia WebAnimator Plus and from there be used in Incomedia WebSite X5! Now that's something! CrazyTalk Animator is a keeper for those of you guys that has the creative imagination to use simple animation for your home/personal needs and for those wanting to be animator-professionals. Educators and instructional material creators will have a handful of possibilities also with it. 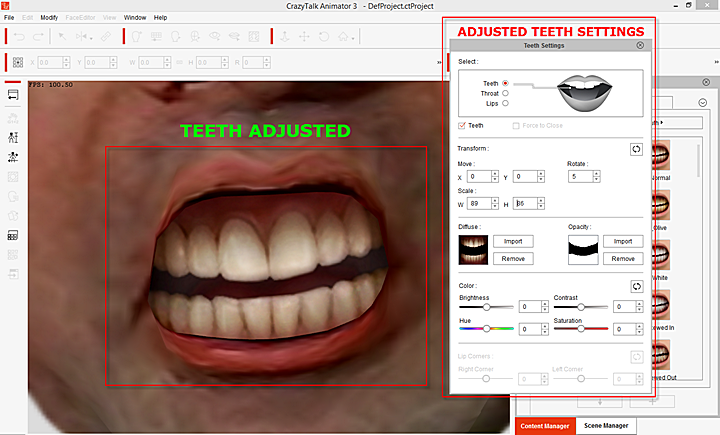 I'll definitely want CrazyTalk Animator in any of my work computer. 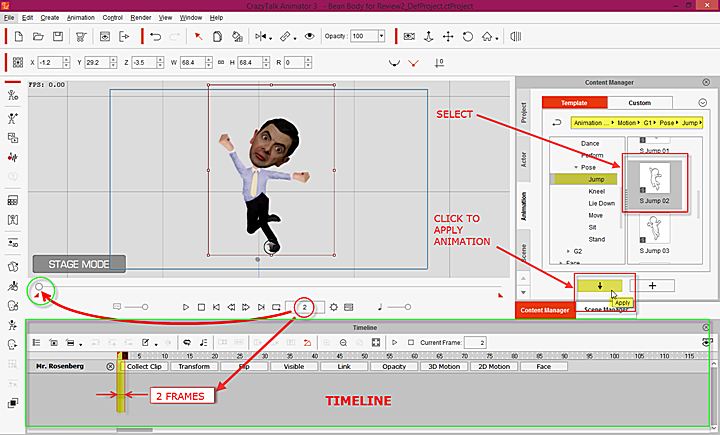 CrazyTalk Animator (CTA) is the easiest 2D animation software that enables all levels of users to create professional animations with the least amount of effort. CrazyTalk Animator is one spectacular piece of software that I have encountered since I tried making some small animations last year. This is a first time I have made pictures/photos talk, attach a photo-head to a character body and make it move and dance! Frankly I was amazed that you can do just do it with a little more than medium learning curve. Its a fun piece to use! 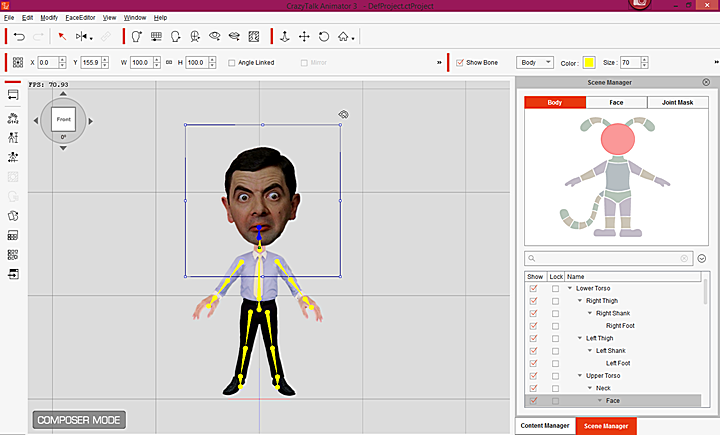 I even laughed at Mr. Bean as I tried all sorts of animation to his face and the character body I used. I have not tried the whole functionality and capabilities of CTA3 Pro but this review made me more interested to try to learn it more and use it. As mentioned in the review/demo, your imagination is all you need and from there you can improvise and make do from that. The finest aspect of CrazyTalk Animator is its ability to be as easy to use and it you need it, be more complex, depending on your project and of course your imagination. I mean after some tinkering creating characters with CTA will be as easy as pie for those of you reading this. 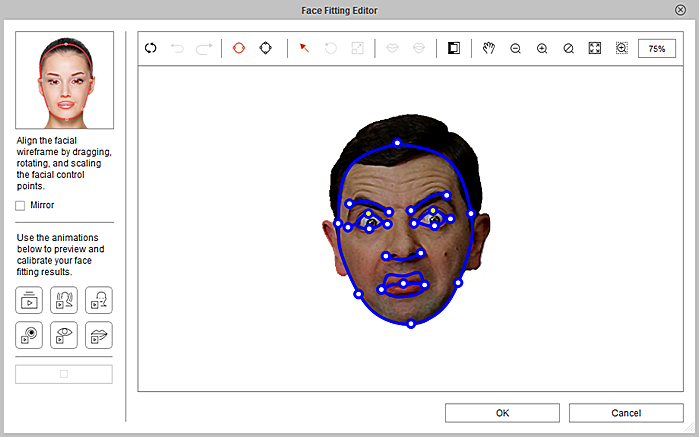 The face animation via "Face Puppet" or "Face Key Editor" is great with its ability to edit facial features to your liking and use auto-lip sync/apply a voice (well I have not tried that yet, using my voice to apply it to Mr. Bean as I have issues with my microphone now the reason I used TTS). One of best part also for new users is even you do not know how CTA3 works the materials provided are there with just a click of the mouse. Well the "help file" is online but if you download the user guide/manual and some instructional videos. It’s all you need to jump-start any project with CTA3. Just have the pictures/images you have and know what you want to do (or what you have in mind with those images), you can start in a jiffy. 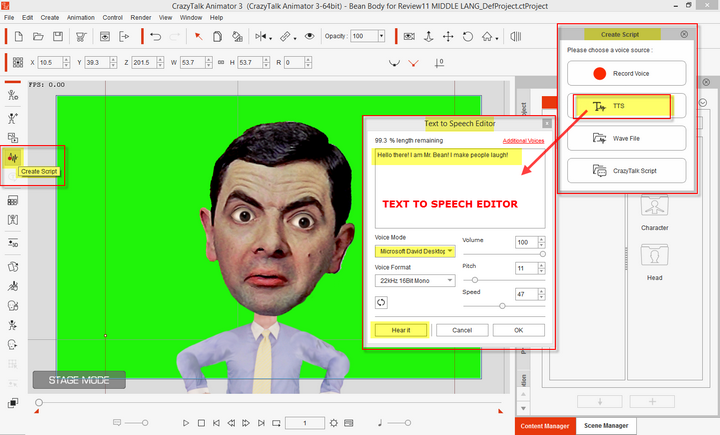 CrazyTalk Animator can also be used in making instructional videos and guides. Yes indeed definitely! It will be a great tool used for educational purposes with all the confusion, kids will definitely be watching any educational video attentively especially that it will be created with, say, cartoon characters like Batman or Iron Man! I'd watch it! This can be an invaluable tool for educators! Content resources to further your needs are available at the Reallusion site for a price. So to those who can shell off some hard earned money to give your animation more "wow" feature you can just go to the site and avail of the discounts there. Every new version at the content store is offered at a discounted price. Always. For those who are in medium-to-intermediate or intermediate-to-(to be) professional CrazyTalk Animator will definitely shine with your preferred arsenal as it can be used in conjunction with other animation software. To those who have experience using other animation software applications like Toon Boon, Moho Studio Pro or After Effects and the like CrazyTalk Animator is pretty much at par with them. Don't get me wrong there this is based on my opinion only as a first-time unprofessional animator (sort of, --speaking of just After Effects and the freeware SynFig Studio). CrazyTalk Animator has the potential to be one of the best animation software out there in the market. Has yet to be proven, as a very serious one though because in my searching and asking around, not any major animation studios use it to create or supplement their shows. But I cannot deny the potential because CrazyTalk Animator's features are impressive even-though a relatively new player. As mentioned the ease of use along with its motion libraries/presets and facial animation/distortion are what it makes it a great animation tool. Definitely the time to create an animation is cut in half while having fun doing your project. 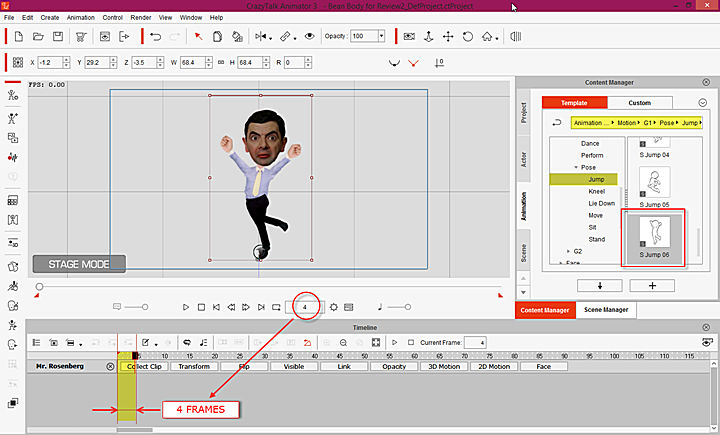 CrazyTalk Animator is easy to learn and more than sooner will have you animating your own creations at the same time mastering the program as you go on using it. Of course the "quality" of any cartoon or animation is really in the skill of the user or the "animator". In any endeavor it is really the skill of the user which dictates the end result. I feel and believe that in using CrazyTalk Animator there is no means preventing you to make "professional" quality animations partnered with a good video editor with good effects in tow. The possibilities here are "not endless" very good. Hell, it also hit me that animations done in CrazyTalk Animator can also be used imported to Incomedia WebAnimator Plus and from there be used in Incomedia WebSite X5! Now that's something! O.o! Spectacular and amazing review!!!!!! !!!! Thanks guys! You watched out also for the iClone Pro Review of BC2Tweak. I am sure that it will be also one great review. Also stay tuned as we will have Reallusion as sponsor here for the giveaways/contest soon! Waiting for 2nd part of @BC2Tweak review! Great review. Might need to download the demo and have a play. LowcyGier, RGiskardR and wwd like this.